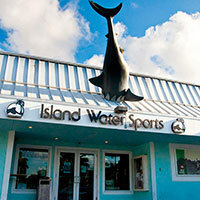 Island Water Sports is located in Deerfield Beach, on the east coast of South Florida. At Island Water Sports surfing is not just our business, it's our blood. We are owned and operated by second and third generation surfers and skateboarders. Kirk Cottrell opened the shop in 1978. His kids, Cheyne, Karly and Linsey took his first steps inside the store and now the 3 of them run it together. We have the most comprehensive selection of products in South Florida, for all varieties of action sports. We have dedicated our lives not just to surfing and skateboarding, but to serving the local and traveling surfer and skateboarder. We are always ready and willing to offer advice on products or just swap stories after a session. head east on hillsboro blvd till you get to A1A. take a left and head north for 2 blocks. We will be the left hand side of the road. We are the building with the shark stuck in the roof.